Monitors are among the most popular lizards kept in captivity, and this colorful guide provides information on the two most commonly seen species, savannah monitors and grassland monitors. Due to the intelligence and relative easy care needs of these lizards, they are favored by beginning herpetoculturists, though great emphasis must be placed on responsible ownership of these beautiful, but delicate animals. 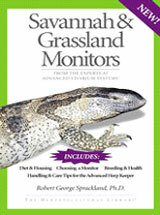 Savannah & Grassland Monitors, written by lizard expert Robert George Sprackland, PhD, provides guidelines for keepers who wish to add a monitor to their vivarium. The chapter called Taxonomy gives an excellent summary of monitor species, including the African species, of which the savannah (or Bosc s) monitor and white-throat monitor are examples, and the Asian species,including the Komodo dragon and the Argus, Bengal, Indian, and gold monitors. This Advanced Vivarium Systems title includes information about selecting a healthy example of the selected species, quarantine and acclimation considerations, handling, housing needs, water and feeding, as well as solid advice about keeping monitors healthy and thriving. A separate chapter on diseases and disorders provides a complete primer on the health needs and veterinary care of these rewarding reptiles.